Did you know British Columbia's first railway was built in 1861? That the first crossing of the Rockies by a car was on railway lines? That West Vancouver had a gas railcar service as early as 1914? That there was a railway where the Coquihalla freeway is now? That BC had an armoured train during World War II? That Canada's smallest railway - on full-size rails - runs daily to and from Lillooet? That North America's last logging railway ran on Vancouver Island until 2017? Includes the building of the Canadian Pacific, its branches and its competitors. Accessing the province's mineral wealth. The second and third transcontinentals - the Grand Trunk Pacific and the Canadian Northern Pacific. Interurbans. The White Pass & Yukon. The Pacific Great Eastern, later the British Columbia Railway. The Golden Age of Steam. Canada's only armoured train. Logging and Mining Railways. The Evolving Modern Railway. The rise of the unit train. Plus: The Preserved Legacy: where to find the province's railway history today. Includes a newly-developed way to trace the paths of old railways. And an appendix listing all BC's railway charters. Lavishly illustrated with historical and modern photos. 240 pages. $44.95 hardcover. Harbour Publishing, November 2018. The coming of the railway changed the world. Yet railways did not begin with the opening of the Liverpool & Manchester Railway in 1830, as so many texts proclaim, but much earlier. Wagons were being put on rails as early as the fifteenth century, and in the fifty years prior to 1830 there were hundreds of railways created, with wooden rails, with iron-topped wooden rails, with cast iron, and wrought iron, each improving on the strength and durability of the previous and, importantly, creating a set of available trackwork that could be used by a new invention—the steam locomotive. Richard Trevithick produced the first and was able to test it on existing iron rails and all the first locomotives had rails on which to run. And the first locomotives were a medley bunch, propelled through racks and rods and chains, even one with legs and one known as an elephant; this even before a young George Stephenson began experimenting with steam locomotion and eventually built the first all-mechanical railway—in 1822, making him the clear choice as the engineer for the Stockton & Darlington Railway which opened in 1825 with a train pulled by his latest steam engine—Locomotion. Yet all through this period it was not clear that such relatively inefficient steam locomotives would be the way forward, and other means of traction were often used, especially stationary steam engines pulling wagons on ropes or chains. This book covers the emergence of the modern railway in a unique, essentially geographical way, providing contemporary maps, many never before published, showing the locations and routes of the early railways. The book is profusely illustrated, for in addition to the maps it has photos of most of the surviving first locomotives and of replicas too, where they exist. There are nearly 300 maps and 400 photos and other illustrations. Much of the early railway system originated in Britain, and so necessarily this is where most of the book is focused, but the earliest railways in France, Germany, and the rest of continental Europe are also considered, as are railways in North America. Several sections cover the emergence of the first steam locomotives, in particular those of Trevithick, Blenkinsop, Chapman, and Stephenson, and the historically important Stockton & Darlington and Liverpool & Manchester railways in detail. In the Canadian edition there is an additional section covering early types of non-conventional railway—atmospheric railways (a technically sound system that failed because of the unavailability of suitable materials) — plus electric railways, underground railways, monorails, and mountain (rack) railways, all of which have fascinating histories. Winner: Roderick Haig-Brown Regional Prize "as the most outstanding work that contributes to an appreciation of British Columbia published this year in the opinion of the judges of the BC Book Prizes." British Columbia was one of the last temperate places on earth to be placed on a world map, being far from Europe on "the backside of America," as the Elizabethans would have put it. Although home to a diverse population of Aboriginal peoples, the region initially lacked the promise of gold that had brought European colonists to southern North America, and early depictions of the West Coast were no more than cartographers' fanciful guesses. Not until the discovery of valuable "soft gold"—sea otter pelts—and quest to find a Northwest Passage did explorations, such as the epic voyage of George Vancouver, lead to a better understanding of the region's geography. Even so, when gold was discovered in quantity in 1858, prompting the gold rush that created British Columbia, the interior was mostly unknown except for the routes that fur traders had blazed. 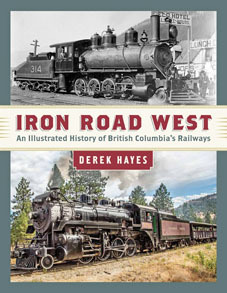 Thirteen years later, British Columbia became a province of Canada, and a transcontinental railway was built to link the land west of the Rocky Mountains with the rest of the country. The efforts of these explorers, fur traders, gold seekers, and railway builders all created maps that showed where they had gone, what they had found, and what they proposed to do—all part of the dramatic tale of the forging of Canada’s western frontier. 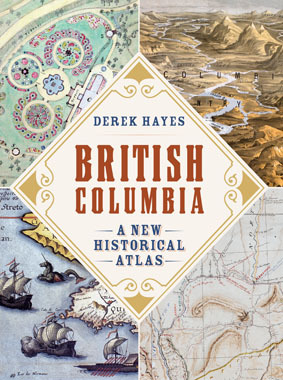 In British Columbia: A New Historical Atlas, award-winning map historian Derek Hayes continues his renowned and best-selling Historical Atlas series by bringing together an unprecedented collection of these contemporary maps, most previously unpublished, in a single handsome volume. Here you'll find surveys, treaty maps, military maps, mining maps, promotional maps, real estate maps—even maps of murder. Alongside Hayes’s lively and authoritative text and an additional three hundred photos and historical documents, these maps, many of them works of art in their own right, offer a geographical visual history—a unique and fascinating view of the province's past. 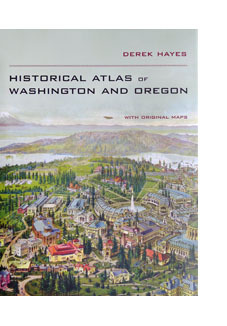 Please note that this book is NOT an updated edition of the now long-out-of-print Historical Atlas of British Columbia and the Pacific Northwest. Only 33 of the well over 900 maps in the new book also appeared in the earlier one, and even those are all new photographs or scans, taking advantage of the significant quality improvements made possible by technological changes in the intervening period. 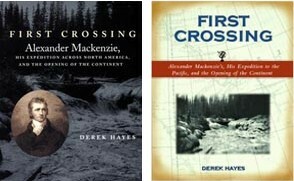 Indeed, over two-thirds of the maps in British Columbia A New Historical Atlas have never been published before at all! To order from Amazon.ca (only $37.58 !!) please click on this link. 240 pages. Full color throughout, hardcover. $39.95. University of California Press. Now in stores. Railfan Dennis Spence of Stillwater NJ wrote, in an unsolicited email: "Possibly the greatest and most informative and entertaining book I have ever seen, and I have thousands of books." A visually sumptuous look at how the railroad transformed North America. The railroad changed the face of North America forever, allowing the its economy to become industrialized and catalyzing settlement and growth within the continent. People and goods could now move vast distances, time zones were standardized, and military use of the railroads transformed the nature of war. This latest book in the popular Historical Atlas series outlines the development of the railroad system from its very beginnings around 1830 through to today’s freight railroads and government passenger services. It features an unprecedented 40 0 -plus contemporary and historical railroad maps, photographs and many other railroadiana illustrations. 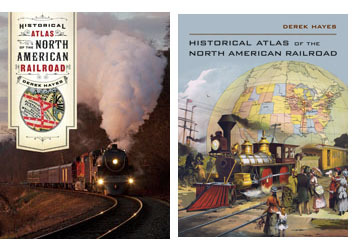 Here is a colourful, integrated approach to the origins and development of railroads—their heyday, decline and modern rebirth—in both the United States and Canada, for anyone who loves art books, history, maps or railroads. Jointly published by D&M Publishers in Canada and the University of California Press in the United States. 224 pages, full color, hardback. Lavishly illustrated with hundreds of maps documenting the history of the American West from the earliest times to the present day. Spectacular in scope and visually brilliant, this atlas presents a sweeping history of the American West through more than 600 original full color maps and extended captions. From the earliest human inhabitants and the first European explorers to the national parks and retirement resorts of today, this extensive collection chronicles the West from uncharted territory to a wellpopulated Eden. 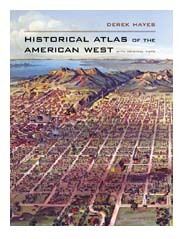 This is the first atlas to compile all the historically significant maps relating to the American West; it includes field sketches of battles, the first maps to show the West, maps depicting mythical rivers and fictional towns, and maps showing early conceptions of California as an island. The book distills many centuries into one fascinating volume. 288 pages, full color, hardback. University of California Press $49.95. 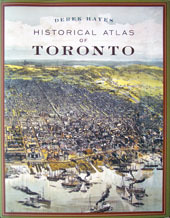 Lavishly illustrated with over three hundred maps, this new book charts the evolution of the city from its origins as a Native village to a French trading fort, to York, the capital of Upper Canada, and finally to Toronto, Canada's largest and most diverse city. Packed with archival photos and memorabilia to complement the maps. 192 pages, full colour, hardback. "You've probably never seen the city the way Derek Hayes has," - effused the National Post (23 Aug 2008). 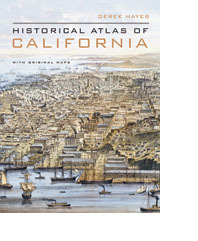 Using nearly five hundred historical maps and many other illustrations--from rough sketches drawn in the field to commercial maps to beautifully rendered works of art--this lavishly illustrated volume is the first to tell the story of California’s past from a unique visual perspective. Covering five hundred years of history, it offers a compelling and informative look at the transformation of the state from before European contact through the Gold Rush and up to the present. The maps are accompanied by a concise, engaging narrative and by extended captions that elucidate the stories and personalities behind their creation. At once a valuable reference and an exhilarating adventure through history, the Historical Atlas of California, featuring many rare and unusual maps, will be a treasured addition to any library. Distilling an enormous amount of information into one volume, it presents a fascinating chronicle of how California came to be what it is today. 256 pages, full color hardback. Nearly 500 maps. Using more than five hundred historical maps from collections from around the world, this stunning book is the first to tell the story of America’s past from a unique geographical perspective. 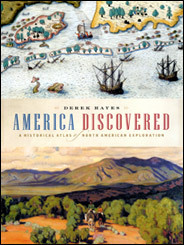 Covering more than half a millennium in United States history—from conception to colonization to Hurricane Katrina—the atlas documents the discoveries and explorations, the intrigue and negotiations, the technology and the will that led the United States to become the nation it is today. The earliest maps were those of the explorers, who, with help from Native Americans, tried to convey in graphic form their ideas of what lay over the mountains ahead. Coasts and ranges,rivers and lakes, peaks and plains are described by Europeans encountering them for the first time. Geographic conceits such as the River of the West took centuries to be dispelled. As settlement spread across the continent, maps were used to attract both immigrants and investors. They charted Indian lands, the location of natural resources, and potential routes for railroads. Surveyors mapped out both international and interstate boundaries. Above all, maps charted the major wars that created and molded the country: the French and Indian War, the War of Independence, the Spanish-American War, and the Civil War as well as more localized territorial disputes. The twentieth century is represented by maps of international conflicts accompanied by accounts of the more peaceful creation of a transportation network, plus the Depression and the New Deal, Cuba, the Cold War, and 9/11. 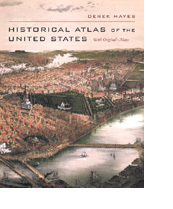 Distilling an enormous amount of information into one handsome volume, the Historical Atlas of the United States highlights the evolution of geographical knowledge at the same time that it presents a fascinating chronicle of the expansion and development of a nation. 280 pages, large format, full color hardback. 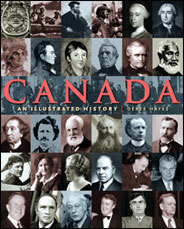 From exploration and conquest to the forging of a nation, this remarkable book charts the course of Canadian history. Through more than 440 carefully selected images and an engaging text, it relates the fascinating stories of a nation in the making. Here are the events, the newsmakers, and the ordinary folk that shaped the Canadian experience. Here are tales of the famous, the infamous, the popular, and the unknown: the natives, the nation-builders, the separatists, and the statesmen; the soldiers, the settlers, the rebels, and the refugees; the artists, the astronauts, the invaders, and the inventors; the motorists, the mail carriers, the fur traders, and the photographers—a myriad of individuals who shaped our country. Through its engrossing commentary and wealth of images both iconic and rare, this impressive volume conveys the drama and scope of the nation's past. Details of "Canada: An Illustrated History"
Now, from award-winning author and book designer Derek Hayes and Vancouver publisher Douglas & McIntyre comes this fascinating new atlas of Vancouver's history. Illustrated with over 370 original maps, many never before seen by the general public, this full-colour, large-format book is a visually spectacular feast for the eyes. The book also contains over 140 archival photographs and artworks and modern photographs. 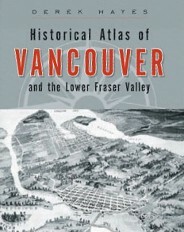 Gathered together in a single volume for the first time, here are the maps that shaped Vancouver and the surrounding Lower Fraser Valley. They depict its days as a fledgling colonial outpost, its appearance on the world scene after the arrival of the Canadian Pacific Railway, through to its emergence as a postwar Pacific metropolis. These maps evoke such historic events and developments as the founding of Fort Langley, the first settlements on the inlet, and the filling in of False Creek, along with more recent aspects of this richly diverse area such as the real estate boom and the explosive growth of Vancouver. Included are many fascinating plans for schemes that never got off the drawing board. Details of "Historical Atlas of Vancouver and the Lower Fraser Valley"
Dreams of gold, imperial aspirations, and an economic imperative. These factors drove Europeans from late in the fifteenth century to risk their lives exploring the uncharted coastline of North America, then penetrating—and eventually occupying—the mysterious and to them unknown interior. America Discovered reveals how, piece by piece over centuries, explorers filled in the map of the "other land" encountered by Columbus in 1492. It confirms through graphic evidence how they were aided by the indigenous people whose territory they were claiming as their own. Besides acting as guides, Native Americans provided valuable geographic information about what lay beyond—although their reports were often misinterpreted, often with intriguing results. Using more than 280 original maps and dozens of historic illustrations, this remarkable atlas shows how geographical myths such as the Northwest Passage and the River of the West were slowly shattered. How rumored "seas" became great lakes, how apparent islands (such as California and Alaska) were found to be peninsulas, and how the full extent of the continent was finally revealed. From famous names such as Lewis and Clark to others more neglected by history, it tells the fascinating story of the men who put North America "on the map". This beautifully-illustrated atlas brings together more than three hundred stunning original maps to illustrate four centuries of Arctic exploration. It charts the evolution of man's knowledge of the top of the world as explored by sail, steam, sledge, and satellite. The maps of early Arctic explorers, often more fanciful than realistic, survive as testimony to their hopes and dreams. Whether artistic or utilitarian, they add a fresh perspective to the stories of their travels and hardships. Collected here for the first time, they show how knowledge of the Arctic was revealed as gaps in the map were filled in over the centuries. The maps are accompanied by an insightful commentary detailing the hopes, aspirations, and motivation of explorers and the often harsh realities they faced. All the major Arctic explorations are covered, from the middle of the sixteenth century to the twentieth-century flights by airship and airplane. 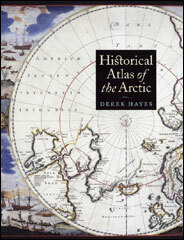 The atlas describes the search for and achievement of the Northwest and Northeast Passages, the race for the Pole, and the search for land in the Arctic Ocean. It concludes with modern scientific exploration by satellite and submarine. It is a unique guide to the perils and obstacles, successes and failures, triumphs and tragedies of Arctic exploration over the centuries. 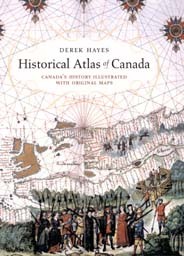 Canada's history comes alive in this fascinating book, which uses period maps to illustrate and illuminate the past. Here are charts of the seizing of an empire and the settlement of the prairie, of war and wanderlust,battles and boundaries, forts and the fur trade, river communications andrailway surveys, rebellion and gold rushes, plus maps of all the major cities, including the map attached to the treaty purchasing Toronto from the Indians. There are plans drawn for governors, kings, princes, and the Empress of Russia; panoramic maps; bird's-eye maps; and three-dimensional maps. Many of the maps are artistic, some utilitarian, but all are included for their historical significance and the story they have to tell. Details of "Historical Atlas of Canada: Canada's History Illustrated with Original Maps"
Here is a major exploration story of epic proportions, romantic, historically significant, and compelling. It is the story of Canada’s most famous explorer, Alexander Mackenzie, who in 1793 became the first person to cross the continent of North America north of Mexico. This new book explains with the help of many contemporary maps and illustrations what drove Mackenzie forward to undertake his dramatic and dangerous quest for the Pacific Ocean, and traces his travels in a highly illustrated and immediate style that underlines both the dangers and the significance of his exploits. The Pacific Ocean, the world’s largest expanse of sea, was only “discovered” when it was found that the continent of America blocked the way to Cathay. Another continent implied another ocean between it and the shores of Asia. Virtually nothing was known about this “new” ocean, but mapmakers did not usually let lack of knowledge get in the way of making their maps; they used their imaginations to fill in the gaps. 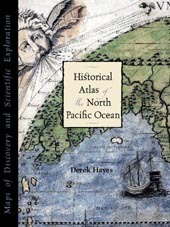 Geographical knowledge of the North Pacific grew only slowly, with few voyages in the northern part of the ocean. In 1728 and 1741 came the expeditions of Vitus Bering for Russia, but it was not until James Cook’s third voyage in 1778-1779 that the bounds of the ocean were truly revealed. After that, the aroused interest of many nations led to a faster pace of discovery. But knowledge of the ocean itself was still meagre, and only started to be revealed with the challenge of the laying of submarine telegraph cables in the second half of the nineteenth century. A number of oceanographic expeditions began to reveal the secrets of the ocean depths in the first half of the twentieth century, but it was not until the advent of modern technology, and in particular the satellite, that comprehensive and near-continuous monitoring of the ocean became possible. Now multibeam bathymetry can reveal the fine details of the sea bed, and an array of high technology allows the behavior of the ocean itself to begin to be understood. But we are still at the edge of a little known world. This stunningly illustrated new book is a historical atlas of the North Pacific Ocean and its shores – China, Korea, Japan, Russia,the United States and Canada. It is a treasure chest of five hundred years of maps; antique maps from the beginning of the sixteenth century to modern satellite images of today. All the important voyages of exploration are covered, illustrated with the explorer’s own maps or contemporary maps which reveal what they thought the geography looked like before they arrived, and what they added to the map of the world. The Historical Atlas of British Columbia and the Pacific Northwest (Canadian edition) and the Historical Atlas of the Pacific Northwest (US edition) is a unique collection of over 320 original maps of explorers and navigators from four centuries of voyages and overland treks of exploration and discovery to the northwest coast, plus native maps, and a host of others selected for their interest or historical significance. There are imaginary and speculative maps, old political boundary maps, boundary dispute maps, military and spy maps, bird’s eye maps, gold rush maps, railway maps and Hudson’s Bay Company maps. All are reproductions of hand-drawn or contemporary engraved originals. The maps are combined with context-setting history, explanations of how the maps came to be drawn, and the history behind them.